As the only sharp knife on the table, steak knives serve two duties — looking good and cutting meat. With a wide array of steak knives available, choosing a set can be a daunting task. To help you make the best choice, this article highlights some of the best steak knives in three price categories (Luxury, Mid-Range, and Budget), discusses what to look for when choosing a set, and answers frequently asked questions. In this list, we’ve presented a few options in each price category (Luxury, Mid-Range, and Budget). We’ve also highlighted sets with different designs depending on whether you prefer a traditional or modern look. 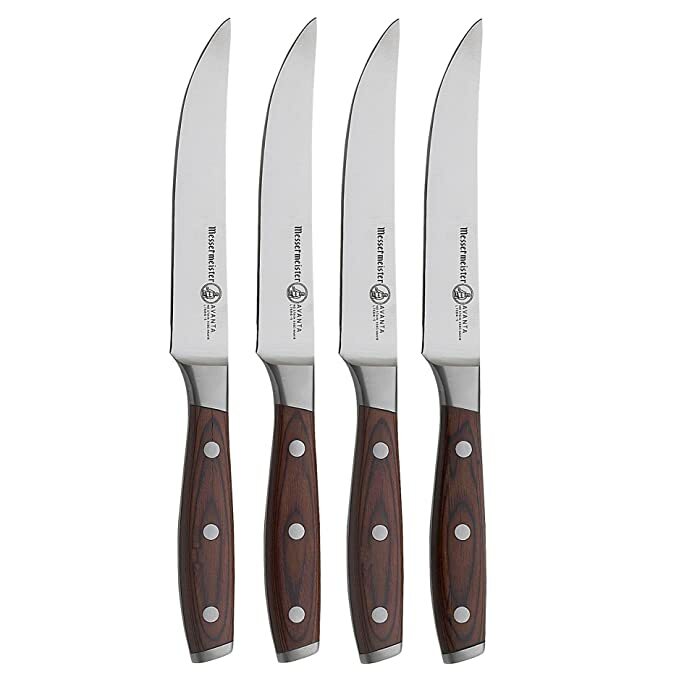 Developed for a leading North American culinary school, the Messermeister Avanta 4-Piece Fine Edge Steak Knife Set with Pakkawood Handles is our top pick in steak knives based on price and performance. Besides looking great, the knives rival the performance of top-of-the-line steak knives but retail for a fraction of the price. 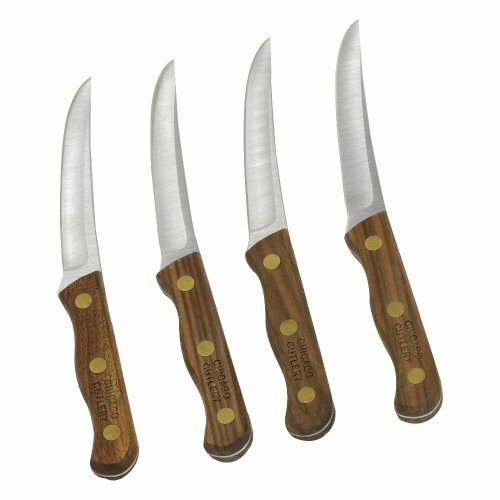 This set features 5-inch, full tang blades made from high-quality German steel. The blades are sharp, resist rust, and can be easily sharpened. The handle is made from Pakkawood, which is water-resistant and durable. Messermeister offers two other versions of the set—one with black POM handles and a stainless steel version. All Messermeister products are guaranteed for life against manufacturing defects. Some users had issues with durability and quality control. Rivets were not always flush with the handle, and the wood handles sometimes chipped or flaked. Recommended For: Anyone seeking high-performance knives at a fraction of the cost. If you want high-end steak knives, an authentic Laguiole set is widely regarded as the crème de la crème. Laguiole refers to the region where the knives are made—not the manufacturer. You can choose from several materials for the handles, including wood, bone, and horn. Each knife is hand-crafted in France and comes with a storage box and certificate of authenticity. Laguiole steak knives have thin, sharp, serrated blades with triple-riveted wooden handles and feature a distinctive bee symbol on the heel of the blade. Laguiole knives are considered works of art, but the distinctive look might not appeal to everyone’s tastes. It can be easy to accidentally purchase a knock-off set so use caution when buying. (Hint: If a Laguiole knife set retails for $75, it is probably fake.) Authentic Laguiole knives are made only by a handful of companies, including Laguiole en Aubrac. The Wusthof Classic Ikon set is our pick for a luxury set of steak knives. They feature the high-level of workmanship and materials expected in a luxury knife set. The 4.5-inch blades are precision forged from a single piece of high-carbon German stainless steel. The double bolsters provide heft and balance for effortless cutting, and the full tang extends through the handle. The triple-riveted black handle has an innovative contoured design for a comfortable and secure grip. The knives are made in Germany and backed by a lifetime warranty. Storage case does not match the quality of the knife set. The Dalstrong Gladiator Series offers a bold yet traditional design. With serrations at 18 degrees per side, the 5-inch, full tang blade requires no sharpening. The blade is precision formed from imported Thyssenkrupp high-carbon German steel that has been heat-treated. Dalstrong also offers a Gladiator Series straight edge blade with hollow divots. The black laminated pakkawood handle is triple riveted, with a grip that ensures comfort and maneuverability. The set comes with protective sheaths—making them safe to store with other tableware. Dalstrong provides an instruction booklet, cleaning cloth, and attractive packaging—making them ideal for gift-giving. The company offers a 100% satisfaction or money back guarantee. The knives are large and aggressive-looking, which might not appeal to everyone. Users with smaller hands might find the knives uncomfortable to grip. 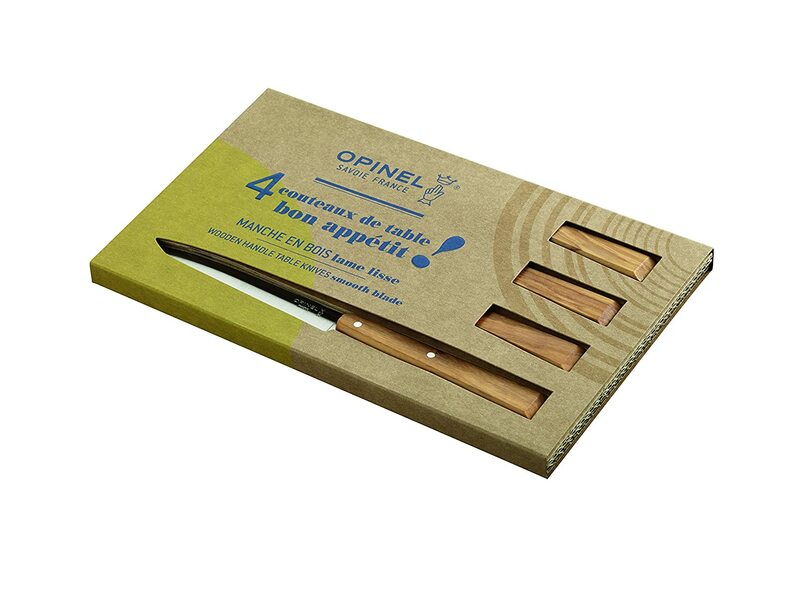 If you’re seeking a contemporary look, consider the Opinel No 125 Bon Appetit Southern Knife Set with matching olive wood handles. If matching handles are too dull, you can choose from sets with different color handles, including the Pop set (bright colors), Countryside set (softer pastel colors), and Loft set (industrial colors). The knives have 4.33-inch blades made of Sandvik 12C27 modified stainless steel. This type of steel is anti-corrosive due to the addition of chromium and requires no special maintenance. Designed and manufactured in France, Opinel products are guaranteed under normal use and can be exchanged in case of manufacturing defects. Some users found the knives too thin and flexible. The knives are shipped in a plain cardboard box for storage. The warranty does not cover damage due to normal wear and tear or improper use. 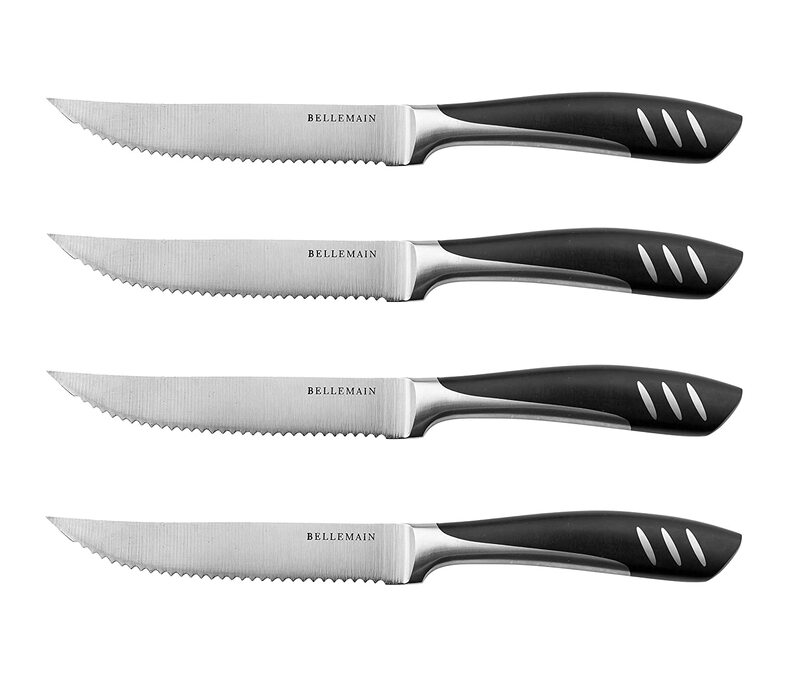 The Bellemain Premium Steak Knife set offers many premium features for less money. 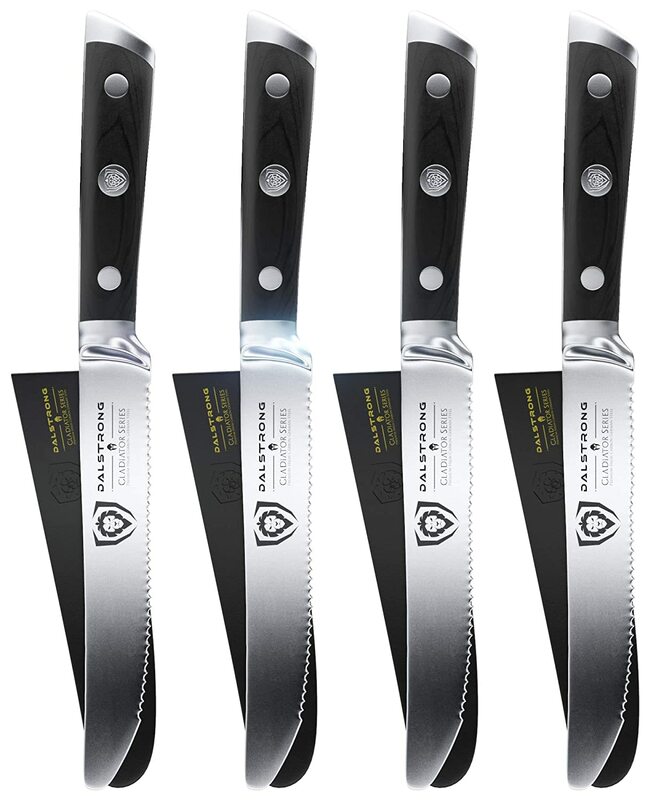 Features include 5-inch, ice-tempered stainless steel blades as well as full tang, which means greater durability. The blades have a hollow ground to minimize sticking. Bellemain offers a risk-free, money back guarantee. 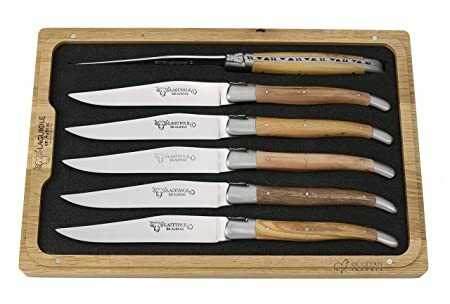 This Chicago Cutlery set offers a traditional steakhouse look and offers some premium features (such as full tang) at a budget price. Manufactured in China, the knives have high-carbon stainless steel blades. The solid walnut handles provide comfort and safety while cutting, while triple-compression brass rivets hold the handles securely for added safety and stability. Some users felt the handles were too thick and uncomfortable to hold. Others users had issues with durability. The design is functional but unattractive. For example, the wood handles are unfinished and somewhat rough. The J.A. 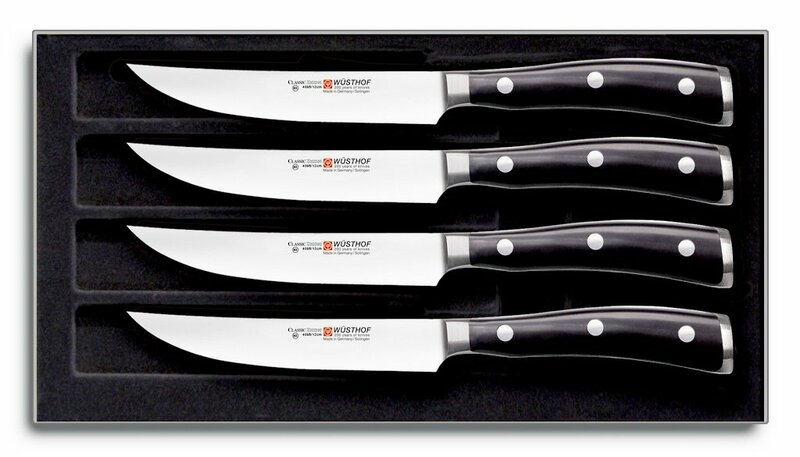 Henckels International Stainless Steel 8-Piece Steak Knife Set offers convenience and value—the knives are dishwasher safe, and the serrated edges never need sharpening. The knife features full tang construction and there are no wooden handles to flake or chip. The set is backed by a lifetime warranty against defects in workmanship or materials. Some users complained of rust spots. Although harsh dishwasher chemicals are never a good idea for stainless steel, these knives can go in the dishwasher. To minimize spotting, consider using a milder detergent or cycle. When choosing steak knives, consider several factors, including the type of blade, blade size, blade material, handle material, construction, fit, set size, appearance, and price. Here is a rundown of the factors to consider when choosing your steak knives. Straight-edge blades cut easily and leave a smooth edge on the meat. However, they need to be sharpened more frequently. Serrated blades (which have jagged edges) require more effort to cut and can leave a ragged edge on the meat. However, they don’t need to be sharpened. Most people prefer a straight-edge steak knife for ease of cutting and the smooth edge it leaves. Steak knives can range from 5 inches to 7 inches. In general, a smaller blade cuts more easily. Steak knife blades can be made of high-carbon steel or stainless steel. High-carbon steel is the higher quality material. It is easier to sharpen and stays sharp longer. However, high-carbon steel knives must be hand-washed and dried immediately to prevent rusting. By contrast, stainless steel doesn’t rust so most people find it more convenient. However, stainless steel blades may require more frequent sharpening. Some steak knives are made entirely of metal, which results in a less conventional appearance (such as the J.A. Henkels set listed above). A traditional steak knife usually has wood handles, which provides a more sophisticated appearance. However, the wood handles can rot if they get wet so do not to soak them in water or put them in the dishwasher. Instead, wipe the blade and ensure the handle is dry. You’ll know if the wood begins to rot because it will have an unpleasant odor. To avoid issues related to wooden handles, many steak knives have plastic handles, which are easier to care for but have a less refined appearance. Steak knife construction plays a vital role in price, quality, and durability. Blades can either be forged by hand (steel is heated and then pounded into shape with a hammer) or stamped (punched out of a sheet of metal). Forged blades cost more because they are made by hand. Another feature to consider is tang, which refers to how long the blade is in relation to the handle. Unless you are getting a fully forged knife (e.g., made entirely of metal), look for full tang, which means the metal from the blade runs through the entire handle and is secured with rivets. (This is why you often see metal pieces on the side of steak knife handles.) Full tang knives are stronger and more durable. A well-constructed steak knife will have an excellent fit, which means there will be no visible gaps between the blade and the handle. The two materials should look seamless. If you can see a gap between the wood and metal, chances are you’re getting an inferior knife. Steak knives are usually sold in sets of four or six. You’ll need to choose the size that is the best fit for your needs. Also, check the number of knives in the set you are buying as it might not always be evident at first glance. Steak knives come in a wide variety of shapes, sizes, colors, and designs, and you should choose a set that suits your unique tastes. Some people will opt for a more traditional look, while others may prefer the unique styling of the classic Laguiole knife. When choosing a set of steak knives (especially if you’re opting for a higher-end set), choose a set that you find visually appealing. Steak knives can range in price from $20 to $400, so your budget will be a factor when choosing a set. However, don’t confuse high price with quality. Many affordable steak knife sets are just as effective and appealing as a high-end set, including the Messermeister Avanta set that tops our list. Q: Why do we have steak knives? Steak knives are the only sharp table knife and are used for cutting meats. Because steak knives are used on ceramic plates instead of cutting boards, they tend to get duller quicker, which is why you don’t want to use your good kitchen knives as steak knives. Also, steak knives are styled to look attractive on a table. By contrast, kitchen knives tend to have a more utilitarian appearance. Q: Do steak knives require special care? Yes … and the amount of care depends on the design and materials you choose. Steak knives with straight edges will require sharpening more often than ones with serrated edges. Steak knives with wooden handles cannot get wet or you run the risk of wood rot, which ruins the wood and creates an unpleasant odor. If you opt for wood handles, wipe the blade separately and ensure the handle stays dry. You won’t have this worry with plastic handles or knives made entirely of metal. A stainless steel, serrated edge steak knife with a plastic handle (or made of all stainless steel) will require the least amount of maintenance, while a high-carbon steel knife with a straight edge and wooden handles will require the most care. Q: How should steak knives be stored? Because of their sharpness, don’t store steak knives loose in a drawer. Instead, store them in the box they came in (if included in the set) or protect yourself by wrapping the knives in a tea towel or using sheaths. Hopefully, this article has provided you with all the information you need to choose a quality set of steak knives that fit your budget and needs. Whether you choose a luxury set to hand down from generation to generation as heirlooms or opt for the value set that requires less maintenance, we hope you find the perfect set of steak knives for your budget and lifestyle. Bon appetit!